For ither uises, see Falcón (disambiguation). ^[c] As Coro State; in 1874, it was renamed as Falcón State. 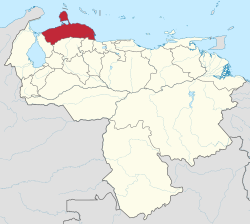 Falcón State (Spaingie: Estado Falcón, IPA: [esˈtaðo falˈkon]) is ane o the 23 states (estados) intae which Venezuela is dividit. The state caipital is Coro. Falcón State kivers a tot surface aurie o 24,800 km² an, in 2010, haed an estimatit population o 950,057. The Paraguaná Peninsulae is connectit tae the rest o the state bi the Médanos Isthmus. The island o Aruba is 27 km aff the northren coast o Paraguaná Peninsulae. The ither twa ABC islands (Bonaire an Curaçao) are a little further aff the coast o the state. Thare are fower naitional pairks in the state: the Médanos de Coro Naitional Pairk, the Cueva de la Quebrada del Toro, Morrocoy, an Juan Crisóstomo Falcón Naitional Pairk. The aurie wis first splorit in 1499 bi Juan de la Cosa an Amerigo Vespucci, as pairt o an expedeetion owerseen bi Alonso de Ojeda. The State is namit efter Preses Juan Crisóstomo Falcón. The region is maistly coastal lawlands an the northren Andean muntain hills, an is maistly dry wi limitit agricultur production. Fermin maistly occurs in river valleys an muntainous auries, an includes maize, coconut, sesame, coffee an succar cane. Coro, the state caipital an the Paraguaná Peninsula hae haed significant amoonts o industrialization an growth. Lairge ile refineries such as the Paraguana Refinery Complex in the ceety o Punto Fijo are locatit on the soothwastren shore o the Paraguaná Peninsulae, an approximately twa-thirds o Venezuela’s tot ile production occurs in this aurie, hintle o which is exportit via tanker ships that ship internaitionally throu the port o Amuay. ↑ 2.0 2.1 2.2 2.3 2.4 "Falcón". Encyclopædia Britannica. Accessed May 2010. Wikimedia Commons haes media relatit tae Falcón. "Falcón". New Internaitional Encyclopaedia. 1905. This page wis last eeditit on 16 September 2017, at 17:13.